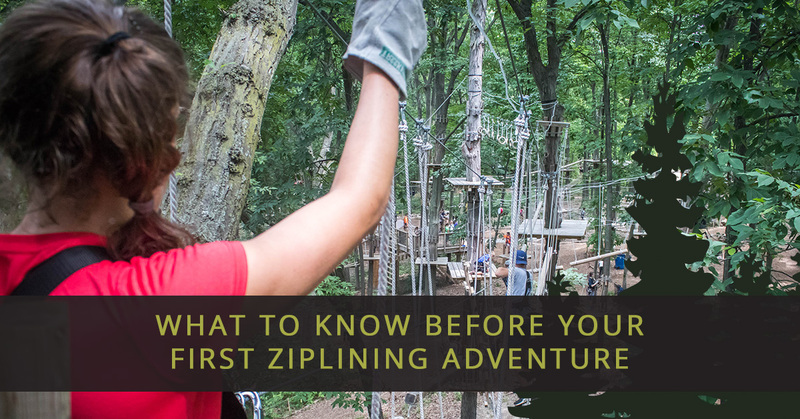 Are you getting ready to go on your first ziplining adventure? #1. Make sure you’re dressed for the part. First and foremost, it’s important to wear the right clothing for a unique outdoor activity, like ziplining. No matter what time of the year it is — yes, even during the hottest parts of summer — you’ll be better off if you wear long pants. This will prevent the straps from rubbing against your skin, which can be painful. Avoid wearing a dress or a skirt, as it poses a safety hazard on a zipline. It’s also important to ensure your feet are properly protected by wearing closed-toed shoes. Make sure to remove any loose jewelry, and if you have long hair, pull it back. #2. Pay close attention to your guide. Before you get strapped in and start ziplining, a guide will be there to give you detailed instructions for how to enjoy a fun, safe ride. All of these instructions are given for your safety, and it’s in your best interest to listen carefully. If you’re not sure about something or your forget about something, don’t just guess; ask the instructor to clarify. #3. Your safety is our number one priority. Almost all outdoor activities come with some level of risk, whether you’re riding your bicycle or climbing a mountain, and ziplining is no exception. However, while it’s possible to get hurt ziplining, the likelihood is quite small, especially if you wear the proper attire and listen carefully to your guide. At TreeRunner West Bloomfield, we’ll provide all of the safety equipment you need, including helmets and safety harnesses, so that you get to the ground safely. #4. Don’t be tempted to take a selfie while ziplining. In this day and age, people document everything from what they ate for dinner last night to how much traffic they encountered on their way to work in the morning. And, it makes sense that you would want to share your amazing ziplining adventure with your social media family. However, ziplining is a two-handed activity, and even though a mid-zipline selfie would probably get tons of likes, it’s simply not worth your safety to risk it. Instead, ask a friend, co-worker, classmate or family member to snag a picture of you while ziplining. It’ll be just as epic, but most importantly, you’ll stay safe. #5. Take a deep breath and relax. Once you’ve gone over all of the safety precautions and instructions with your instructor, you may start feeling a little nervous about ziplining. This is perfectly natural, but you shouldn’t let your nerves get in the way of enjoying this one-of-a-kind experience. Trust us, once you step off of the platform, all of the fear will be blown out of your mind, and the rush of adrenaline will quickly take over and leave you feeling like a million bucks. #6. Take advantage of the other aerial activities we have to offer. At TreeRunner of West Bloomfield, we’re proud to be your premier source for ziplining adventures, but we don’t stop there. 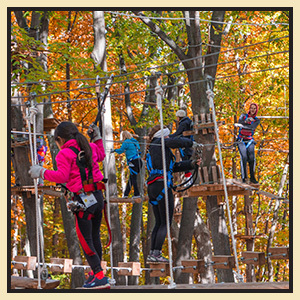 Our adventure park is a full aerial park, and we offer more than 130 ziplines and obstacles, with seven different courses and three different difficulty levels. We offer so much to explore for people of all ages, and when you come to visit us to try ziplining, it’s the perfect time to take advantage of the many activities we have to offer. Book your first ziplining trip with TreeRunner West Bloomfield today. Whether this is your first ziplining trip or your 10th, at TreeRunner West Bloomfield, our goal is to provide you with a fun, safe outdoor experience like no other. And, once you check out our incredible aerial park, you’ll see why we’re your number one choice. Don’t wait! Contact us to book your ziplining adventure today.